I think the powers that be in Las Vegas assume everyone is going to win their millions but there are still plenty of free things to do in Las Vegas. You just have to find your way past the overpriced teas at Starbucks (normally $2.25, Vegas price $4.55) and the opportunity to gamble every second of the day. Whilst we found lots of free things to do in Las Vegas, we also treated ourselves. Thom booked a night in a hotel as a surprise and it was one of the best hotels I’ve ever stayed in. Made even better by the fact that we could stand upright in it (unlike in our van). We got frozen cocktails by the pool and had so much fun. I genuinely wanted to cry when we had to leave the next morning. Given that we had treated ourselves, we kept most of what we did in Las Vegas pretty cheap. 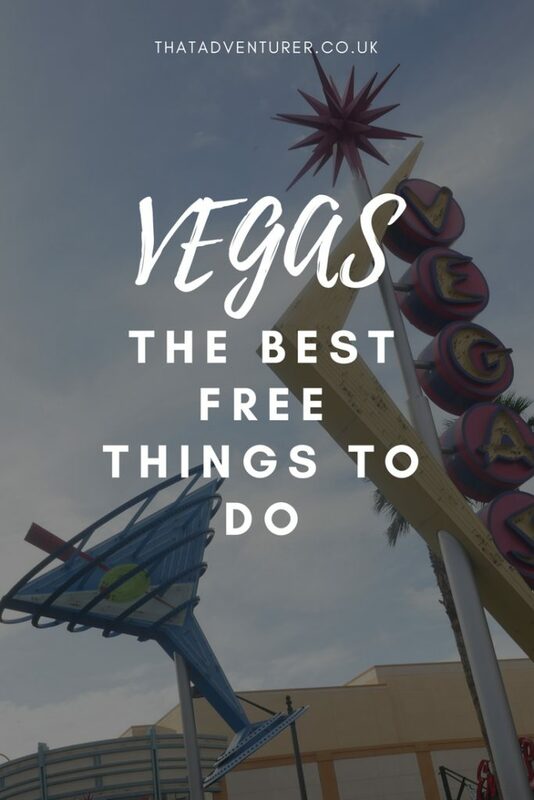 Did you know there are tonnes of free things to do in Vegas? If you’re wondering what to do in Vegas on a budget then check out these ideas. 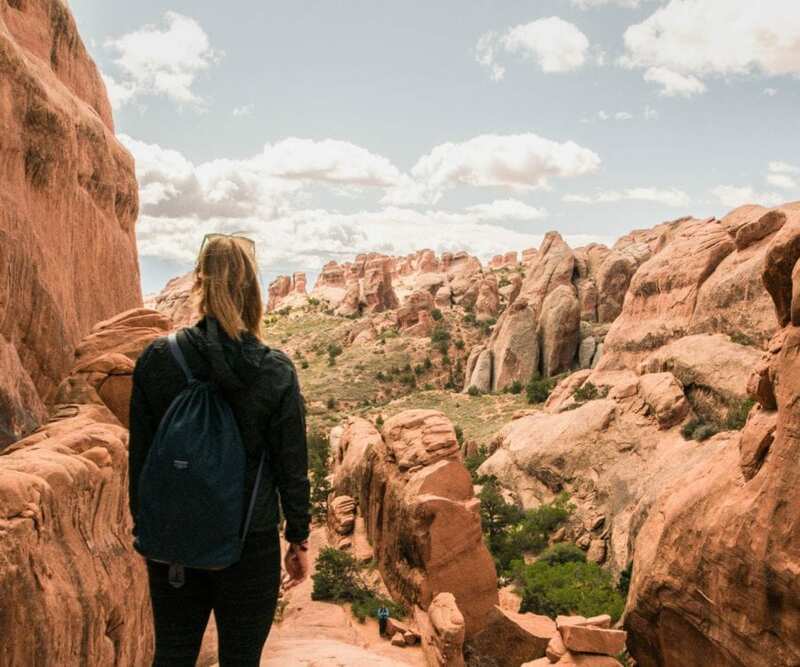 You’ll still feel like you’ve experienced Las Vegas after seeing these top Las Vegas attractions and you won’t come away with regret. 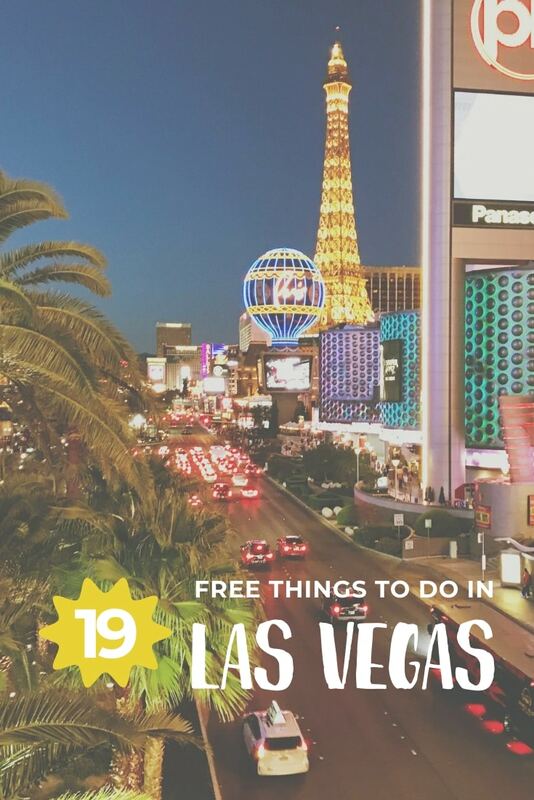 If you’re after the top 10 things to do in Las Vegas then you’re in luck as I have even more cheap things to do in Las Vegas in this list! Want more Las Vegas posts? You’ve travelled all the way to Las Vegas but why stop there? Once you’re in Vegas all you need to do is take a walk down the strip and you’ll find plenty of things to see in Las Vegas. There’s a replica Eiffel Tower, the canals of Venice, the Statue of Liberty and even a replica of Italy’s Lake Como! 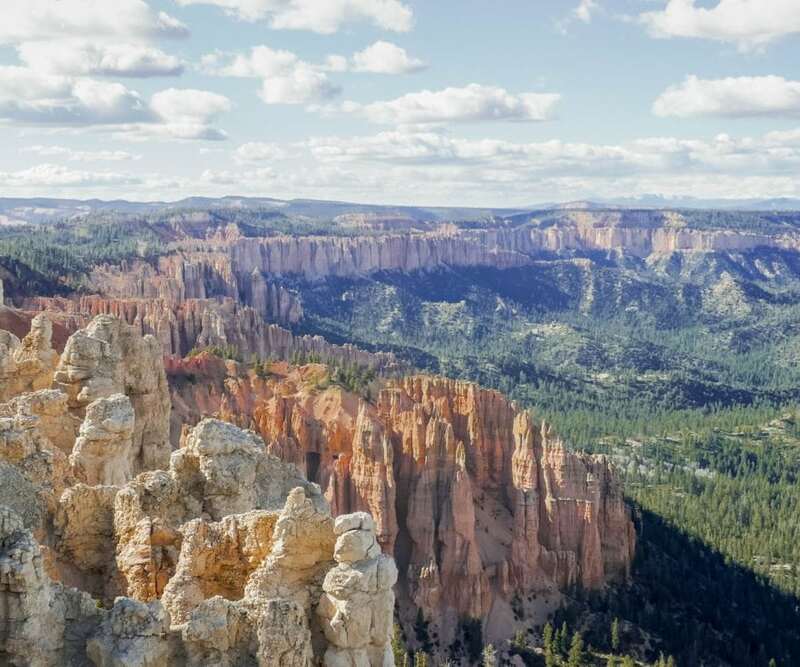 The fact that you can see all these in one city is awesome and it’s definitely one of the answers to the question “what to do in Las Vegas?” These mini countries in Las Vegas are just some of the best places to visit in Las Vegas. Want more things to do in Las Vegas? Get the Lonely Planet Las Vegas guide! One of the weird things about Vegas is that you’ll feel like you’ve been there a hundred times before even when it’s your first visit. If you’re up for some Las Vegas sightseeing go and see where some of your favourite films were made; it’s pretty much a must do in Las Vegas and one of the best things to do on the Vegas Strip. There’s the Bellagio Fountains from Ocean’s 11, the poolside at Garden of the Gods from The Big Short and, of course, Caesars lobby from The Hangover. It’s so hot in Vegas. We left our exploring of the city until the late afternoon when it was a little bit cooler and spent the rest of the time either by the pool or in air conditioned casinos. If you’re staying in the centre of Las Vegas then this is one of the top things to do in Las Vegas strip. Most hotels have a pool attached to them which is free for residents. If you do fancy spending a little bit of money then try out these cool pools. Check out Mandalay Bay’s outdoor playground, which features a lazy river, a wave pool and a sandy beach. The Boulevard Pool at the Cosmopolitan overlooks the Strip from four stories and at the Golden Nugget Downtown you can take a waterslide and see a tank full of sharks. Away from The Strip, East Fremont Street is fast becoming a hip, cool neighbourhood. The area used to be a fairly dangerous place to be but now it’s full of trendy bars (with more of a rock scene than the trance music of The Strip), shops, restaurants and even bookstores. Since its revival it has become one of the best Las Vegas tourist attractions and it’s proof that there’s more stuff to do in Vegas than just gambling. It was probably my favourite area in Vegas (apart from the hotel) and I’d say it’s a must do in Vegas. I loved the vintage-y signs and the rock atmosphere. What’s that? I’m telling you to go to Vegas and then go on a hike? Well, you know me. I do love a good hike and hiking is a perhaps my favourite of Vegas activities. Yes, technically not in Las Vegas but if you’re looking for things to do near Las Vegas then this is it! 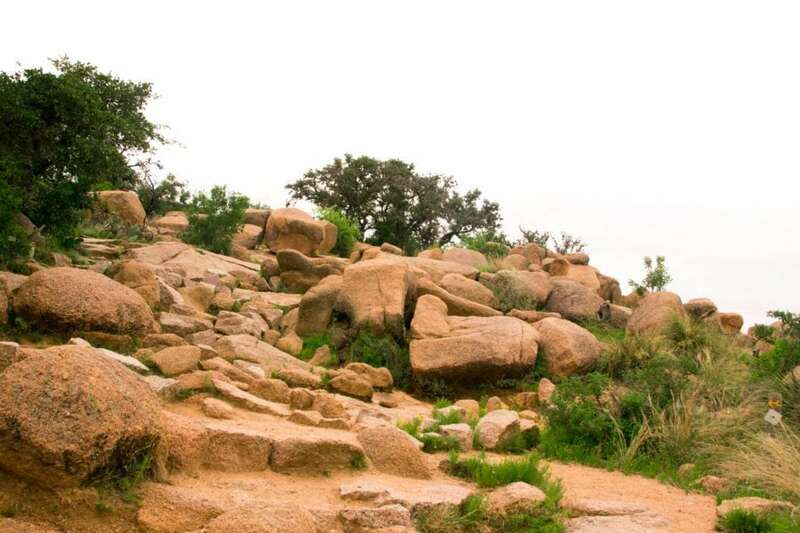 If you’ve hired a car then put it to good use and go hiking. It’s not long until the urban sprawl turns into desert (although it is longer than I thought. I’d always imagined a couple of streets and then just desert and it’s not quite like that). 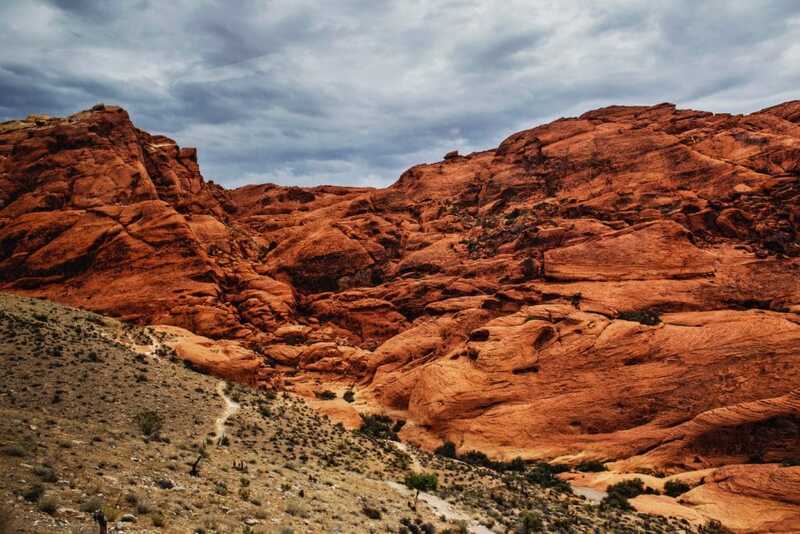 We’d just come from exploring a multitude of National Parks a little further away but for hikes closer to Las Vegas itself then head to Calico Basin where you’ll see Red Rock Canyon. 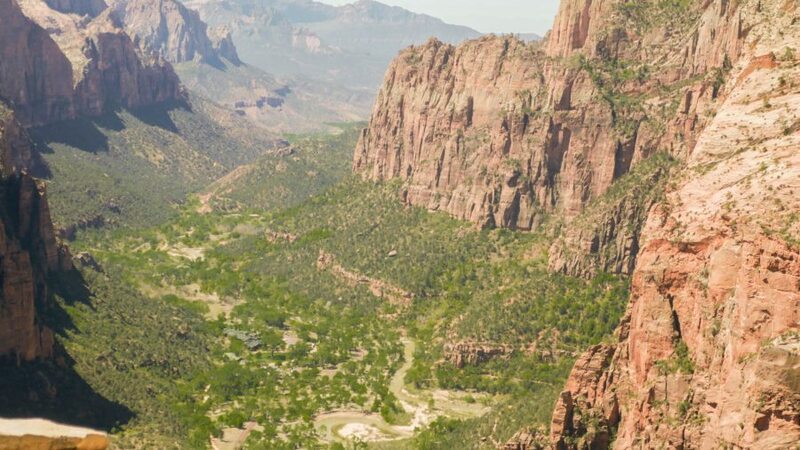 To the north is Mount Charleston or a challenging route at Goldstrike Canyon where you’ll find ropes to help you and some natural hot springs along the way. The Mirage hotel puts on a show every night for free and it’s just one of the super fun things to do in Vegas. 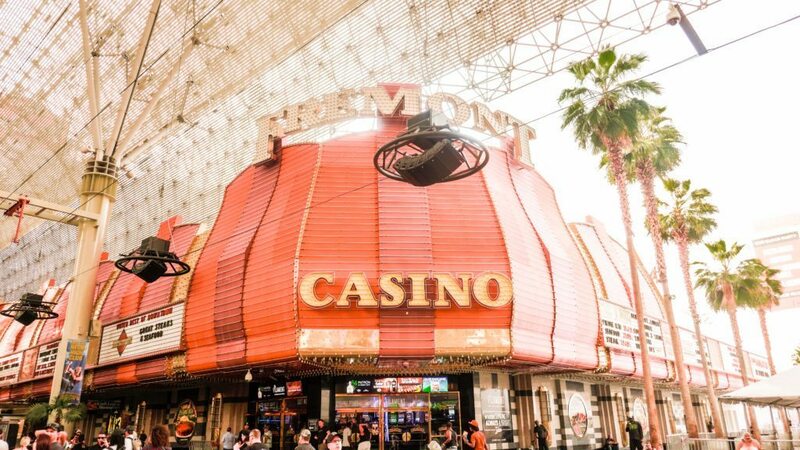 Besides cool vintage signs, Fremont Street has it’s own free experience that’s now a major tourist attraction and one of the top things to do in Vegas during the day and night! The Fremont Street Experience is a canopy that covers a pedestrian walkway full of casinos, cheap eats and a really weird restaurant where you dress up in hospital clothes and prepare to eat yourself to a heart attack. It’s one of the fun things to do in Las Vegas during the day but it’s arguably even better at night. The canopy has a nightly overhead light show called Viva Vision which is completely free and there are musicians busking along the walk too. We saw a boy who can’t have been older than 10 absolutely bossing it on some drums! Inside Caesars Palace Forum Shop a collection of statues regularly comes to life in a free show. This is one of the best Las Vegas shows and at the top of things to see in Vegas! 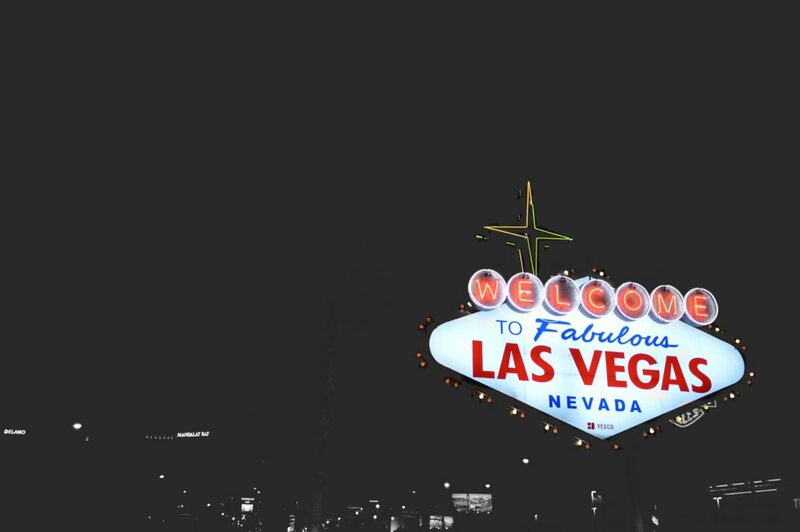 You can count of incredible lighting and plenty of sound effects – it’s Las Vegas after all! Arrive early at the Fall of Atlantis to secure a good viewing position around the fountain. A stroll through the Forum Shops is entertaining all by itself, since there are loads of re-created ancient statues but this free Las Vegas show tops it off! I haven’t lost it, I promise you really can see flamingos in the middle of the Las Vegas strip. AND it’s free! Just a few minute’s walk away from the bustling Strip is a secluded area full of flamingos. 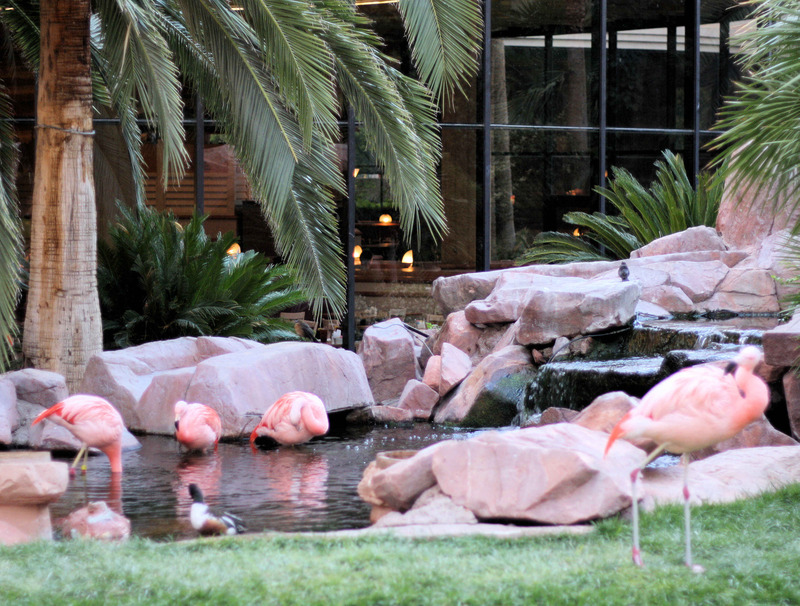 At the Flamingo’s Wildlife Habitat you’ll find flamingos, swans, ducks, koi, turtles and even a couple of pelicans! This may be one of the stranger things to do around Las Vegas but it’s a good example of Las Vegas fun. 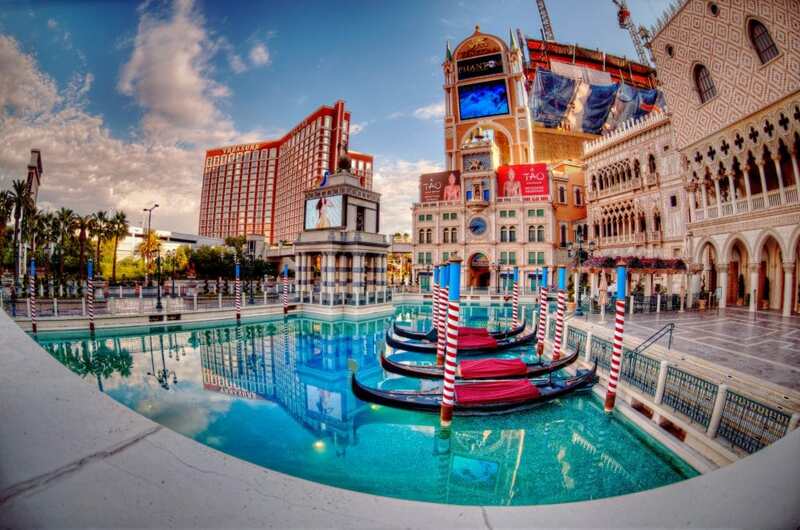 Whether you plan to gamble or not you should visit the Bellagio Gardens during your visit to Vegas since they’re up there with the best things to do in Las Vegas – https://www.cpaymentmethods.com/. The gardens are huge and change with the seasons. Sometimes you may see gigantic Christmas trees and at others, rare flowers. It’s open 24/7 so visit whenever you happen to be nearby. At The Venetian Casino you can stroll alongside Venice’s Grand Canal (or take a gondola), relax in St Mark’s Square AND watch some street performers too. At these Las Vegas points of interest the Venetian have dubbed these performers “Streetmosphere.” Singers, performers, and living statues line the inside of the casino (much like Covent Garden back home in London). There are also costumed singers who’ll serenade you and plenty more to see! The dancing waters of the Fountains of Bellagio have become one of the best Las Vegas’ activities for free and is a must on your list of places to see in Las Vegas. They sure are impressive! Jets of water shoot hundreds of feet into the air and sway gracefully to music. It’s one of the best things to do in Vegas and seeing it only once won’t be enough! 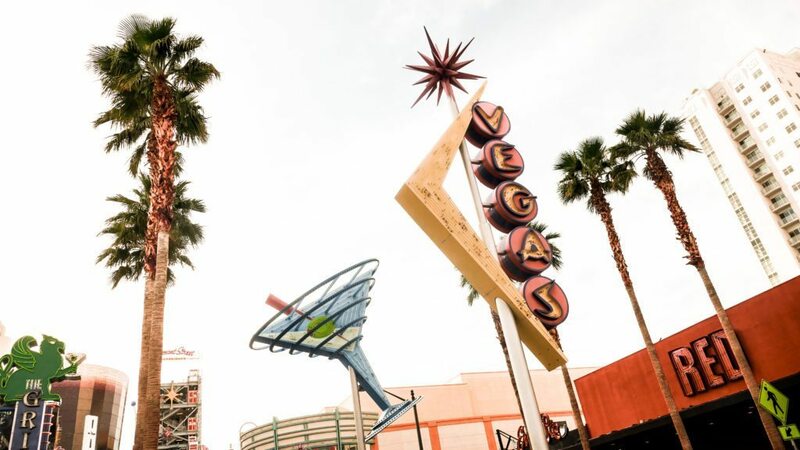 Designed back in 1959, the famous neon sign welcomes millions of visitors to Las Vegas each year. For many years, the sign was on the outskirts of town and stood in the median to greet drivers, but now it’s surrounded by hotels and has become popular enough that a parking lot was built just for it. Looking for fun things to do in Las Vegas? Here’s a one way to have some Vegas fun. The Downtown Container Park is a just like Shoreditch’s Box Park or Brixton’s Pop Brixton. It’s a mix of retail, dining and play made entirely of shipping containers which automatically makes it one of the cool things to do in vegas. The difference is that there’s a huge 55ft tall, fire breathing praying mantis outside! There’s free entertainment most days. You can see what’s coming up here. Still wondering what to see in Las Vegas? How about this stack of dollars? That’s even better than finding Las Vegas freebies. The Gold Tower hotel is home to a Golden Nugget which was found in Australia in 1980. It was then sold for more than a million dollars! 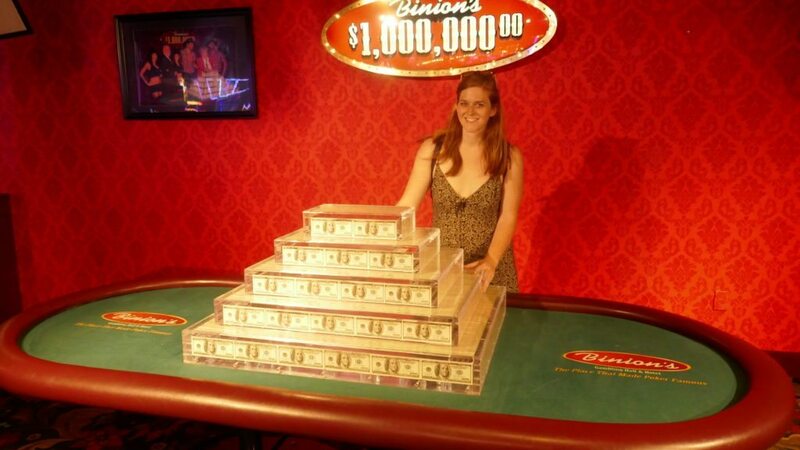 You can also get your picture taken with a million dollars at Binion’s Gambling Hall home of this free attraction in Las Vegas. Unfortunately this one is just for American citizens who live outside of Vegas so I couldn’t take part. But if you are American then you can get free money just for watching some TV pilots! Now that’s got to be on a list of top 10 things to do in Vegas. To do so just sign up at the CBS Television City area in MGM Grand. Simply give your feedback and walk away with some money! They were paying $30 when we were there! There’s loads of free show in Vegas but did you know about this one? Circus Circus has circus performers that take to the Carnival Midway stage twice an hour throughout the day. They include trapeze artists, aerial acrobats and clowns. This makes Circus Circus one of the most fun places to go in Las Vegas and the show is completely free – go check out this must see in Vegas! On the first Friday of the month, Downtown holds a free party that’s open to everyone. Not only is this one of many cheap things to do in Vegas, you’ll get to check out art exhibits earlier on during the party but then it turns into a lot of booze, food trucks, and girls in tank tops. There’s no charge to enter, so just show up and hang out.